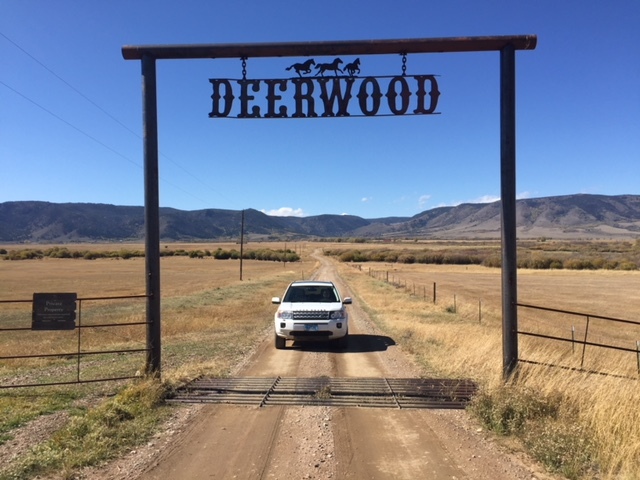 In the Snowy Mountain Range near Laramie Wyoming is a beautiful ranch called Deerwood. This was the first wild horse eco sanctuary in the USA, approved by the Bureau of Land Management. 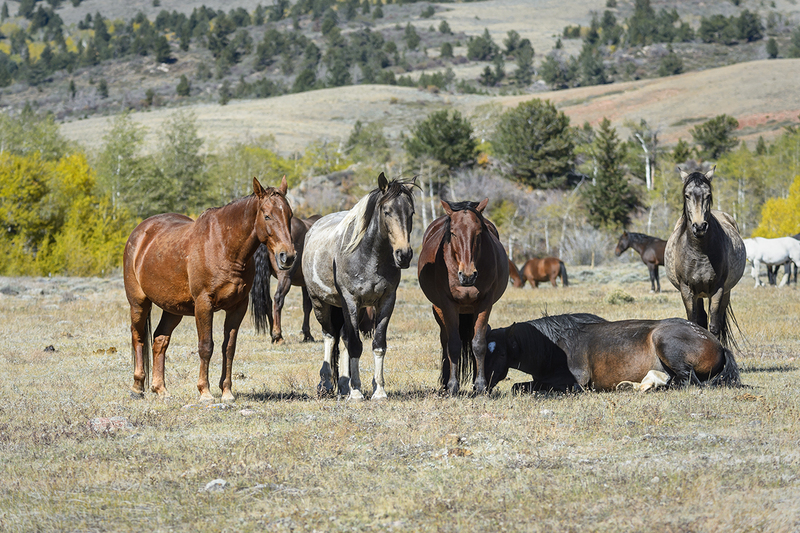 More than 350 Wild Wyoming Mustangs (geldings) have found their final home here over the past 5 years. Previously this was a cattle ranch but the cost of sending the cattle to feeding stations to fatten them up (as at 8,000 ft + the cattle just don’t put on weight) cut too far into the profits. 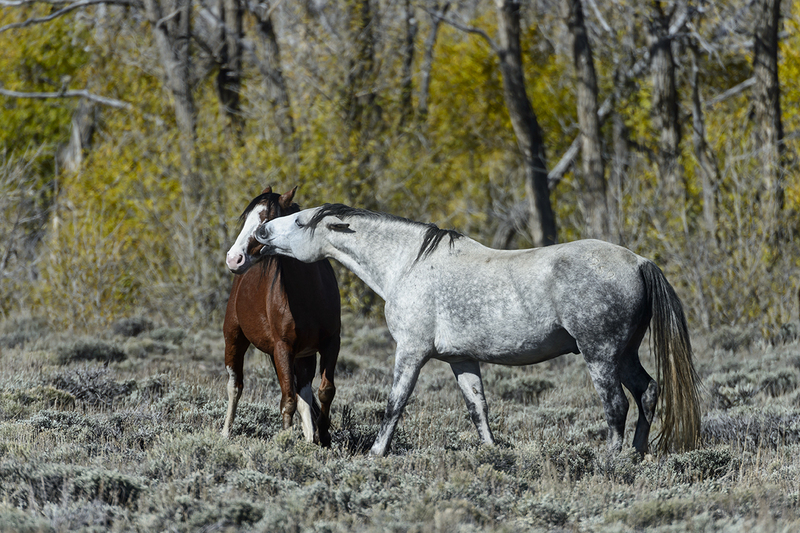 The owners welcomed the opportunity to help the BLM save the wild horses. 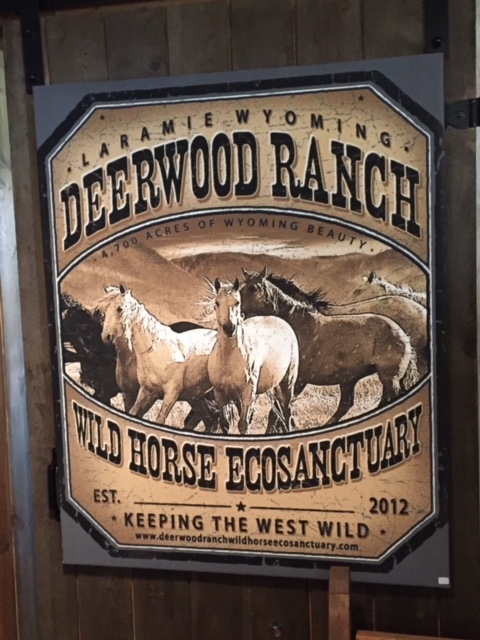 Deerwood Ranch’s proposal had all the features that BLM required: large acreage at various altitudes with a river for fresh water, crop fields for grazing, rocky fields for maintaining unshod hoofs, and trees for shade. Once BLM accepted Deerwood the owners had only a month to install 20 miles of fencing which they achieved with a day to spare. The ranch’s idyllic setting makes it a wonderful place to visit for several hours or stay over in a rented cabin for longer. The ranch founder’s grandson gave us a personal 2+ hour tour on an ATV, that ended far too quickly. We learned so much about wild horses, their origins and how very different they are from domestic horses. These horses had all had 3 unsuccessful attempts at adoption (3 strikes) before they were brought to Deerwood which will be their final resting place. Amazingly they all have beautiful shiny coats, manes and tails as they naturally pair up and groom each other. They know how to heal themselves of wounds and minor injuries by standing in the river. They rely on the rocky areas to keep their hoofs filed down. And they protect each other, even when they are sleeping, standing up or lying down. Sleeping – standing up and lying down. Most did not take much interest in us but a few got up close and personal. The ranch also has some potbellied pigs, ponies, goats, cats and dogs that greet you when you first arrive. A few hours here was just not enough! We will be back! Leaving the Ranch – We Will Be Back! This entry was posted in General Information, Mammals, Places to Revisit, Wildlife and tagged Cody, Deerwood Wild Hores Ranch Eco Sanctuary, Lexar Digital Film, Nikkor 80.0-400.0mm F/4.5-5.6 VRIII, Nikkor TC-14 EII, Nikon D4S, Snowy Mountain Range, USA, Wild Horses, wildlife photography, www.mothernatureimages.com, www.richardkingphoto.com, WY, Wyoming. Bookmark the permalink. 1 Response to Wild Horses Coundn’t Drag me Away. Thanks for sharing your newest adventure Louise and Richard. Love the wild horse pictures- power and peacefulness all rolled together.